While shopping in Kyoto, we thought PB and J would be a quick and easy meal, and started to gather the associated items. When it came to peanut butter, we grabbed a dish of something that looked like creamy peanut butter and was labeled “Peanut Cream.” It turned out to be something that both resembled and tasted like a thick peanut butter pudding. We tried again, returning to the store and picking up a container that had pictures of actual, shelled peanuts on the packaging. Nope. As it turns out, peanut butter (at least as we know it) seems to simply not exist in Japan. In America, drink machines usually come in ones or twos and are located in places like cafes, parks, and malls, and typically carry pop, energy, and sports drinks. In Japan, you will find a drink machine on literally every block—not an exaggeration—and it is not unusual to see three or more drink machines lined up next to each other (see the cover photo of me with the vending machines). Also, they carry primarily coffees and juices, and maybe one kind of pop (usually Coke, although on rare occasions you’ll spot grape soda or Sprite). Japan is a sushi lover’s dream. What you buy in America at fancy grocery store for $10, you can get in Japan at a tiny convenience store for $3—and it tastes just as good. Sushi is cheap, fresh, and there’s almost always a place nearby. The Western-style toilets in Japan are incredibly complicated. There is usually no handle to flush the thing--if there is, it often swings both ways depending on how much water you want to use. 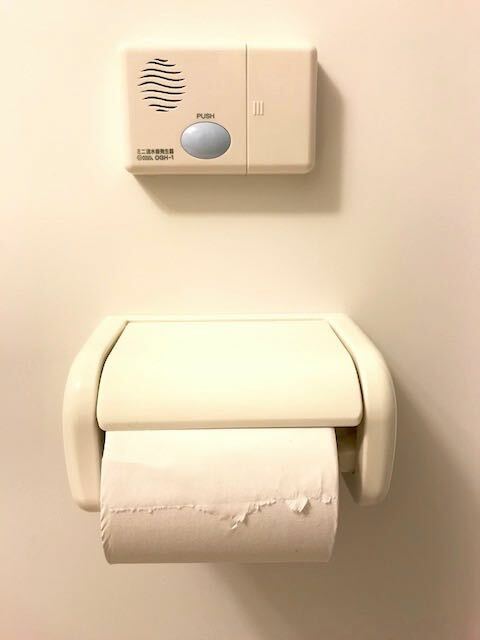 Instead, you are presented with a confusing keypad of buttons, which is often attached to the wall, and only one of these buttons actually flushes the toilet. (We're too scared to see what the other buttons do.) Also, some bathrooms will have separate sound boxes that, if activated, will loudly blast the sounds of a bubbling brook or waterfall. Apartment buildings in Japan tend to be very skinny. Most apartment buildings have room for only one apartment on each floor—bigger buildings can fit two smaller rooms. For example, the apartment building we’re in now has 5 floors, with one room on each floor. It’s quite different from the sprawling apartment complex communities found in America. At your regular ol’ 7-Eleven or FamilyMart in Japan, you’ll find underwear, instant noodles, t-shirts, ice cream, magazines, hair ties, and more. However, you are very UNlikely to find a box of Tylenol. Instead, medicine appears to be dispensed by street-side vending pharmacists. Sounds shady, right? But after successfully shooting down a nasty cold with a box of cold medicine from one of these little places, we realized they’re probably the best option if you are in need of over-the-counter medicine. Most people go around in business-worthy attire—for men, dark slacks and a white shirt, and for women, puffy skirts or pants (usually with big bows around the waist) and a plain shirt. It's almost like a uniform. However, a lot of people—women especially—accessorize these outfits with "kawaii" (the Japanese word for "cute") keychains, pink Hello Kitty purses, and character phone cases. (I watched a prim and polished business lady on the train whip out a Toy Story-themed iPhone the other day.) And then, there are the people who break away from this style completely and decide to create their own genre, like this teddy bear dress that we spotted at Kyoto Station. Teddy bear dresses: a new trend? The bathtubs that we’ve seen so far are pretty stubby—you sort of have to fold yourself to get into them. But what they lack in length, they make up for in depth—Japanese bathtubs tend to be deeper than American bathtubs. When we stayed in Fushimi, our AirBnB had such a deep bathtub that a regular-sized person would be at least up to their thighs—or higher—in water if standing in the filled bathtub. The Japanese use their tubs for soaking (after they have showered in an adjacent area), so the depth is nice for that. The first time I tried to take a shower, I was quite alarmed when I turned on the water heater and it spoke to me. I was even more surprised when I tried to turn up the temperature on the heater, and it spoke again. Since then, we’ve also heard from our fridge, and the elevators (one of which rambled on nearly half the ride), and even several garbage trucks that drive past. When eating at a restaurant, you will not be provided with a napkin: you’ll be handed a packaged wet-nap. At fast-food or more American-style places, there will also be a box of regular napkins on hand, but if you’re eating somewhere with more of a Japanese vibe, the one wet-nap is all you get. If you’re eating somewhere nice, you’ll get a warm, damp washcloth in lieu of something disposable. So those are my top 10 things you probably didn't know about Japan. Did any of them surprise you? And if you've been to Japan, what would you add to this list? Let me know in the comments below!